Original HP LaserJet CB435AD Twin Pack 35A Black printer toner cartridges. Two (2) x 1,500 page yield printer cartridges. Cheaper then buying singles. Excellent Value. Designed for use in HP Laserjet mono model printers P1005, P1006, P1007,P1008. When using the HP genuine CB435A toner cartridge dual twin pack you can reduce downtime get greater value for money and save shopping time in the long run. 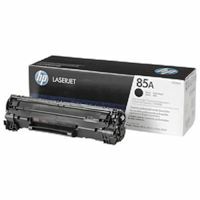 The HP 35A black printer toner cartridge twin pack contains Two (2) toner cartridges at a discount price making printing cheaper than if you had to buy just one HP CB435A toner cartridge at a time. 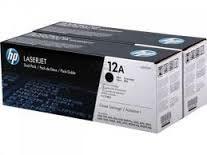 When one HP CB435AD toner cartridge runs out there is an immediate replacement allowing you time to restock. When using original HP toner supplies 35A toner cartridges your grey scale images are crisp and text bold for longer. 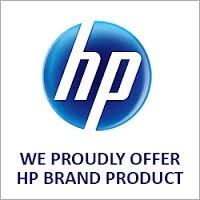 HP's latest toner and cartridge technology offers more value, helps lower the cost of buying HP genuine toner cartridges with this twin pack discount offer for higher volume busy printing offices. You can reduce your business printing costs without sacrificing reliable or professional results and simplified twin packs makes ordering easier. Dependable results page after page only original HP 35A, CB435A printer toner cartridges can deliver. Next working day low cost courier delivery to Brisbane, Sydney, Canberra, Melbourne, Adelaide, Perth and immediate surrounding suburbs.